Another Snake in the Eagle’s Shadow cash-in, but one with a neat little cast, including a delightfully evil Hwang Jang-lee and some nifty kung phooey throughout. 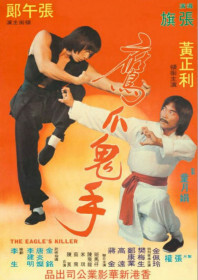 John Cheung plays the orphaned bumpkin-type who is desperate to learn kung fu but is disappointed in his choice of sifu, until beggar Fan Mei-sheng saves the kid from some bullies and teaches him all he knows. Hwang Jang-lee plays an eagle claw assassin (surprise, surprise) who is hired to take out the two. The beggar is slaughtered leaving John Cheung to go head-to-head with bootmaster Hwang in an extended duel to the death. It’s not particularly inspiring, but it’s still a pleasant watch. Studio: Sun Wah Film Co.